Gaffer's Tape is a real stage tape not to be confused with Duct Tape. Gaffer's tape is made with a fine cloth weave that leaves little to no adhesive residue behind once it's removed. Duct Tape, on the other hand, leaves that sticky, gummy, residue. 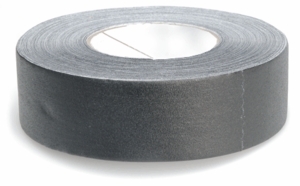 Hosa now offers musicians and stage hands real Gaffer's tape--and best of all, it's black. Available in 60 Yard rolls, 2 inches wide (48mm)x 180 ft.